For one day only (that being yesterday), the white and black 32GB DROID RAZR was available for $279. Today, another $20 has been hacked off of the price giving you the opportunity to purchase one for $249. 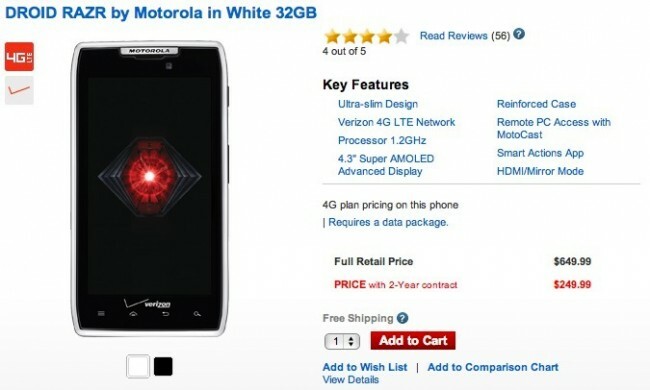 It may not pack the 3300mAh battery that Moto included in the RAZR MAXX, but at $249, you are getting somewhat of a decent deal. For $50 less though, you can pick up the 16GB RAZR and then toss in your own micro SD card to get to the same amount of storage. That really is the only difference – an SD card.